This was supposed to be posted back on April 16, but it got lost in the shuffle. I’m releasing it now without edits. I’ve posted a lot in the last two days, so I’ll just link to these articles with minimal comments. Jeffrey Tobin posted this about prisoners at a Baltimore McDonalds on The New Yorker’s website today. He discusses how prison is a ubiquitous experience in certain parts of America. This article from NBC news reports that even casual use of marijuana causes brain damage. The news is more grim for heavy users (those that use 3x a week or more). In the spring of 1932, 43,000 people (including 17,000 veterans) marched on Washington DC to demand WWI bonus money that had not been paid out. It was known as the Bonus March. Most of the veterans had been out of work for a long time and were really struggling during the first few years of the Great Depression. President Hoover sent in the Army (led by General Douglas MacArthur) and had them forcibly removed. A smaller group marched on Washington the next year and FDR avoided the mistake of his predecessor, sending his wife to talk to them instead of using armed force. However, the veterans did not get their money until Congress passed the Bonus Act in 1936, four years after the march and 18 years since the end of WWI. It would be neither the first nor the last time that America had not honored its debt to her veterans. As America celebrates Memorial Day with baseball, barbeque and the beach, the Veterans Administration has been in the news because its delays, inefficiency, incompetence and corruption has caused the deaths of many veterans. This is just the latest tragedy that has befallen our Soldiers, Sailors, Marines and Airmen. 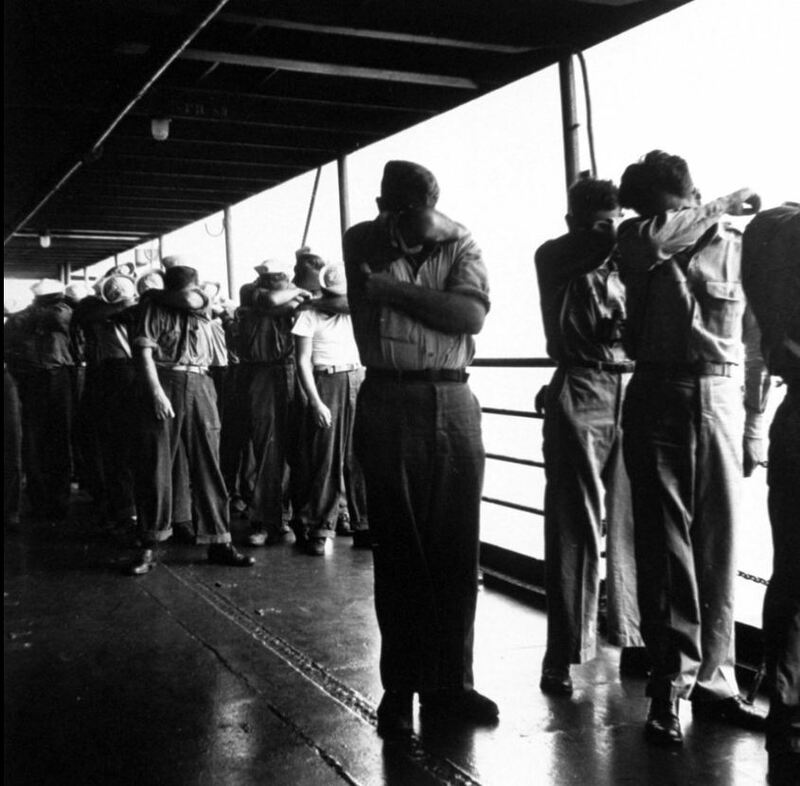 During the Pacific Nuclear testing in the 1950’s, thousands of sailors were exposed to dangerous radiation (in the picture below, they just shield their eyes from the blast). At first, they were told that they weren’t in any danger. As time passed and more and more sailors got sick, the evidence became overwhelming that they got sick from radiation exposure. They were eventually compensated, but it was much too late and not nearly adequate. The military experimented on its personnel with amphetamines and LSD in the 1950’s as well (members of the Armed Forces have historically made great guinea pigs, as they are legally bound to follow the orders of their superiors and also disproportionately made up from poor and/or minority groups). U.S. District Judge Claudia Wilken ruled the Army must notify veterans of possible health concerns related to the experiments. In November, the Army requested a delay in the process, claiming the notification process would cost nearly $9 million. This request was denied after Wilken ruled the cost borne by the Army paled in comparison to the health of veterans. While in Vietnam, the veterans were told not to worry, and were persuaded the chemical was harmless. After returning home, Vietnam veterans began to suspect their ill health or the instances of their wives having miscarriages or children born with birth defects might be related to Agent Orange and the other toxic herbicides to which they were exposed in Vietnam. Veterans began to file claims in 1977 to the Department of Veterans Affairs for disability payments for health care for conditions they believed were associated with exposure to Agent Orange, or more specifically, dioxin, but their claims were denied unless they could prove the condition began when they were in the service or within one year of their discharge. By April 1993, the Department of Veterans Affairs had only compensated 486 victims, although it had received disability claims from 39,419 soldiers who had been exposed to Agent Orange while serving in Vietnam. In the 1990’s, servicemen were instructed to take the Anthrax Vaccine. Early on, there was some suspicion that there were a number of problems with it and that it may have caused the Gulf War syndrome. Those that refused to take it were threatened with a court martial and/or a dishonorable discharge (I declined to take it in the late 1990’s while in the NJ Army National Guard). Five years ago, CNN reporter Jack Cafferty asked the question “Why don’t we take better care of our veterans?” (click on it and read in horror how little has changed in five years). The article cites delays at the VA, inadequate care, skyrocketing rates of PTSD, addiction and suicides. Little was done then and little is being done now. A few years ago, I began hearing about how therapists were asked to diagnose soldiers and veterans with borderline personality disorder instead of PTSD (if a soldier has PTSD, then the military must pay for that soldier’s treatment; borderline personality disorder is a diagnosis that is considered lifelong (so not the military’s fault) and the treatment of it is not paid for by the government or by insurance). The New York Times published the story about a female therapist (a Captain) who was discharged because she had borderline personality disorder. She didn’t have borderline personality disorder; instead, she had PTSD from serving in a war zone. The military has a long history of diagnosing personnel with disorders they don’t have in order to get rid of them. Many of those aforementioned substance abuse problems began in the military when doctors prescribed the servicemen painkillers. One of my current students at Rutgers was a Marine in Afghanistan. While over there, he was wounded. He experienced PTSD and had trouble sleeping. There were many Marines in his unit with similar issues. The unit doctor prescribed them all with Xanax and Oxycotin. They were able to sleep better and return to the field, for a time. Eventually, they became addicted and were discharged under other than honorable conditions. My student returned to NJ and quickly moved on from pills to heroin. He ended up on the streets of Paterson. His story is the rare case in that it has a happy ending – he got sober, learned a trade, went to community college and then transferred to Rutgers. He is a good, honorable man and an excellent student. And he is ineligible for VA services. Two weeks ago, the New York Times ran a front page story about veterans and painkillers. It’s fantastic and I urge you to read it here. …we must do whatever we can to help veterans, those who remain in service and those who become civilians. The wounded should be cared for and treated with the best medical and rehabilitative services we have. This includes physical, mental and psychological wounds. These are all casualties of war. And yet my student and thousands of other veterans like him in NJ can’t get federal or state funded treatment. Republicans and Democrats like to wear flag pins and talk about the sacrifice of veterans yet they continually fail them when it comes time to provide and fund treatment. And many citizens are not much better – they repost memes and pictures on Facebook and engage in hashtag activism, but that doesn’t solve this problem. Call your local and state officials. Let them know you are outraged. Tell them you want funding (real funding) for the mental health and addiction treatment of all veterans, including those with other than honorable discharges. The great exception to all of this has been the G.I. Bill, which has paid for millions of veterans to go to college since the end of World War II. The G.I. Bill was partly responsible for the post-war economic boom of the 1950’s and 60’s and largely responsible for the success of that generation. The G.I. Bill is both a reward and an investment in our veterans. We need to build on it. Addendum (5/26 12:07 pm): Steve Fulop, the current mayor of Jersey City and another 2017 Gubernatorial hopeful, penned his own op-ed for Memorial Day as well (you can see Sweeney and Fulop lining each other up in their sights). While it is better than Sweeney’s and follows up on my own summation, it misses on a few of my aforementioned points. Rebecca O’Brien of the Bergen Record was a finalist for a 2014 Pulitzer Prize in journalism for her reporting on the heroin crisis in NJ. Her most recent article details how New Jersey’s plans pale in comparison to Vermont’s efforts. I’m quoted in the article several times, and the line that most brings me down is this: “I think we will be a middle-of-the pack state” in regards to our drug policies. This is an excellent report that you may have missed from the end of 2013. It details what each state is doing, makes a number of findings and issues several recommendations. Appalachia and Southwest Have the Highest Overdose Death Rates: West Virginia had the highest number of drug overdose deaths, at 28.9 per every 100,000 people – a 605 percent increase from 1999, when the rate was only 4.1 per every 100,000. North Dakota had the lowest rate at 3.4 per every 100,000 people. Rates are lowest in the Midwestern states. Rescue Drug Laws: Just over one-third of states (17 and Washington, D.C.) have a law in place to expand access to, and use of naloxone – a prescription drug that can be effective in counteracting an overdose – by lay administrators. Good Samaritan Laws: Just over one-third of states (17 and Washington, D.C.) have laws in place to provide a degree of immunity from criminal charges or mitigation of sentencing for individuals seeking to help themselves or others experiencing an overdose. Medical Provider Education Laws: Fewer than half of states (22) have laws that require or recommend education for doctor and other healthcare providers who prescribe prescription pain medication. Support for Substance Abuse Treatment: Nearly half of states (24 and Washington, D.C.) are participating in Medicaid Expansion – which helps expand coverage of substance abuse services and treatment. ID Requirement: 32 states have a law requiring or permitting a pharmacist to require an ID prior to dispensing a controlled substance. Prescription Drug Monitoring Programs: While nearly every state (49) has a Prescription Drug Monitoring Program (PDMP) to help identify “doctor shoppers,” problem prescribers and individuals in need of treatment, these programs vary dramatically in funding, use and capabilities. For instance, only 16 states require medical providers to use PMDPs. The concept of providing college courses in prison or helping ex-offenders enroll, attend and graduate from college is a political loser. Back in February, New York Governor Andrew Cuomo proposed to re-institute college courses for those in state prison. He stated that more than 50% of ex-offenders return to the criminal justice system within 3 years of leaving prison. At a cost of $60,000 a year, that is a terrible return on public money. He said that GED and college programs would cost about $5,000 per inmate per year, and that those that take part in educational programs while incarcerated have a much lower rate of recidivism. Some people applauded the move. Polling showed that the proposal was supported by voters statewide by a 53-43 margin. The Governor engaged in a media tour and gave a strong interview on NPR. Less than 2 months later, the New York Times reported that it was dead on arrival and that Governor Cuomo had dropped the ball. One legislator said “Hell no to Attica University,” while other representatives proposed a kids before cons act. Even though it made long-term economic sense and had a majority of public support, Governor Cuomo could not get it through the state legislature. On Thursday, Governor Chris Christie stated that these programs had already been successful in NJ and that he supported their expansion. Unlike Governor Cuomo, Governor Christie did not propose spending any public money on the programs (this is becoming his new move: he supports a program/idea without putting any money behind it – like he recently did with prescription drug monitoring programs). NJ-Step is a privately funded program that provides education to prisoners and helps them transition to two and four year NJ colleges. The press conference got a lot of coverage and received some of the same backlash as the New York program did. Over 60% of people voted that they were against it in an unscientific poll on NJ.com today. A cursory glance at the comments reveals the antipathy that many feel towards this issue (if one were to gauge the quality, morality, and empathy of humanity by reading the comments on news stories, one would almost certainly be discouraged). As I wrote in the beginning of this post, the issue is a political loser. Democratic and Republican politicians are not only afraid of losing general elections but of getting picked off in primaries. These programs anger a significant portion of the electorate and are therefor extremely difficult for a politician to publicly support. It will require a skilled politician to rally bi-partisan support. There will need to be a long education campaign, and we will need ex-offenders to be the face of it. I’ve had the pleasure of working with two of those faces over the last 4 years. Ben Chin will graduate from Rutgers later this month with a degree in Linguistics and a minor in Public Health. He has earned a 3.9 GPA and was selected for Rutgers Skull and Bones. He won the Truman Scholarship in 2013 and the Luce Scholarship in 2014. When you meet Ben, you will be welcomed by his smile, charmed by his personality, impressed with his ability and surprised by his humility. Ben was incarcerated from 2008 to 2010 in the Mountainview Correctional Facility. Ben got sober right before he went to prison in December of 2007. I met him in the fall of 2009 when I took a couple of Rutgers students into Mountainview in order to talk to people about addiction, recovery and education. Ben called me the day he got of prison and after a couple of interviews, we accepted him into the Rutgers Recovery House. In addition to being an exceptional student, Ben has engaged in service work. 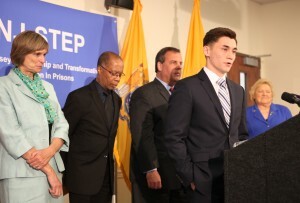 He has spoken to high school students around NJ, college students around the country and has been a public face of what recovery and education can do for ex-offenders. Regina Diamond is another outstanding example. She graduated from Rutgers in 2013 with a Bachelors in Arts & Social Work. She completed her degree with a 3.9 GPA and a number of honors. Later this month, she will graduate from Fordham with her Masters in Social Work. She served several years in prison in her late 20’s because of crimes she committed in order to feed her drug habit. She finally got sober after her sentencing and went to prison in recovery. It would be two years before she could attend an AA meeting while incarcerated (there weren’t any offered). Her hopes were dashed when she was told that she missed the age cut-off to take college classes by a couple of months (that policy has since changed). She did not take any courses while in prison, but immediately enrolled in school upon her release. She has been sober for 10 years now and plans on giving back to society in a number of ways. She does not make any excuses for her negative behavior while under the influence of drugs, and she expresses deep gratitude to all the individuals and institutions that have helped her over the last several years. Regina and Ben were the co-keynote speakers at the 2013 GCADA Summit in New Brunswick. They spoke openly about their journeys and earned a standing ovation. Their stories begin with a combination of bad decisions and bad luck and ultimately reach a pit of despair. They found (were led to) recovery and eventually made their way to Rutgers. They have achieved redemption and now seek to improve the lives of others by sharing their stories and serving as role models. Despite the fact that college for prisoners is a political loser and morally off-putting for some people (I do understand that position), it is an economic winner. It’s time to stop wasting money and throwing away lives. I believe in Ben Chin and Regina Diamond. I hope you will too. Addendum (6/1/2014): Great article on a NY college in prison program that was featured in the Sunday New York Times. The Sober Truth is a book that was published in March of 2014. It is written by Dr. Lance Dodes (a psychiatrist) and his son. It is a polemical attack on Alcoholics Anonymous that is not based on fact, but a series of anecdotal stories. Back in March, The Atlantic published an article/review of the book that asserted the Dodes’ book as truth rather than opinion. That article made the rounds on social media and was discussed and (slightly) debated within the treatment community. Not surprisingly, it has been used by people who are in treatment programs as a reason why they should not go to AA or NA (it is a good example of confirmation bias). “The Sober Truth asserts that addiction can be treated with psychodynamic psychotherapy, which focuses on unconscious feelings and thoughts. But while there is some scientific data for cognitive behavior therapy in addiction, there is little to no evidence that psychodynamic therapy is effective for any type of drug abuse. The authors’ blanket claim of efficacy for their own cherished treatment, in the absence of credible data, is the very flaw for which they harshly criticize A.A. But the book’s most glaring deficiency is the authors’ dismissive attitude and misunderstanding about the role of neuroscience in addiction. There are some people who get clean and sober just by going to AA meetings. Other people need more help. That includes individual counseling (cognitive behavioral therapy and/or motivational interviewing have the best results), group counseling, family therapy, transitional and/or recovery housing, recovery supports, higher education, vocational training and in some cases, medication. These different types of treatment work very well with 12-step meetings. We know more than we did 10 years ago, and we knew more then than we knew 30 years ago. The treatment field continues to improve. As we move forward, we will continue to get a better understanding of how the brain works. We need to continue to get more public and private funding for prevention, treatment and especially recovery support services. This can be done by encouraging quality research and reducing the stigma of addiction and recovery. Unfortunately, Dr. Dodes’ work does neither. In fact, he has violated the Hippocratic Oath – he has done harm. This is an outstanding article in the May 5, 2014 issue of The New Yorker. It’s about a doctor and his medical practice that prescribed thousands of people with opiate painkillers in Wichita, Kansas from the late 1990’s until around 2010. While he seemed to truly care about his patients, he was clearly naive and under-trained. Most significantly, he allowed his head-nurse/office-manger/wife to make a number of questionable business and medical decisions. Many of his patients died and he was sentenced to 30 years in federal prison. Chris Christie recently vowed that he will not decriminalize, legalize or expand medical marijuana under his watch. (5) last year, almost 3 million Americans were arrested for underage drinking. if we legalized marijuana, we will see an increase in the number of people arrested for underage marijuana use. this will also require more police. once you hire police, they stay hired (you don’t temporarily hire them). As a clinician, I stand to make more money if marijuana is legalized. I’ll see more people in treatment and have to write more reports for court cases. Despite the fact that I would make significantly more money, I am against marijuana legalization. Many people that are pro-legalization stand to make a lot of money off of it. Be wary of them. All that said, marijuana has been legalized in Colorado and Washington. There is no need to rush to change the policies in our (or any other) state. Let’s see what happens over the next 3 years in Colorado before we make any public policy changes. We are going to get a lot of data from Colorado. I expect that the tax revenues will not be as high as expected, that there will be an increase in motor vehicle accidents, that more people will be admitted to treatment for marijuana and that more people will be arrested for marijuana. I am willing to admit I’m wrong in the face of good data and will publicly recant my positions. I strongly doubt that will happen though.